Before I start writing an article – about any topic – I usually first decide on the angle I want to take. Sometimes this comes to me immediately; sometimes it takes a little longer. Yet with the de Fossard Solar Time Clock, even as I write this I am still not sure of the angle to take! I have, however, realized that the reason for this is that this clock is so many things all at once, representing so much that taking a single angle would not do it justice. Part of my conundrum comes from the origin of the clock. From their workshop in the village of Southwick, located in the southwest corner of England, an environment befitting any British murder mystery show, a husband-and-wife team dedicated 5,000 hours to the creation of this clock. George and Cornelia de Fossard didn’t do this out of the blue; in fact, George is a second-generation clockmaker whose father founded the company in 1968. George himself pursued an engineering degree at the University of Nottingham, later utilizing his knowledge as he trained as a clock restorer at West Dean College. It was there that he met Cornelia, who was enrolled in the same college, yet specialized in furniture restoration. 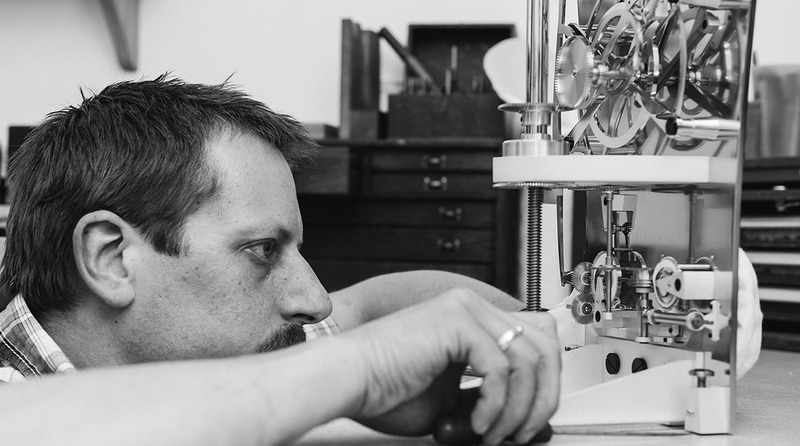 While the couple spends most of its time restoring clocks, the destiny of many clockmakers left today, true passion for making them remains evident. Despite the incredible investments in time and money that come with such an undertaking, along with the uncertainty of recuperating any return on said investments, the pair embarked upon this journey. And we should be thankful. Personally, I wouldn’t even regard this de Fossard creation as a clock but rather a time-telling sculpture, first and foremost because it unites the past, present, and future in a single object. Its design is rather futuristic; I would even say almost timeless. The same can be said of the mechanics, but rather than reaching into the future like the design, they go back to the heyday of clockmaking. What does the de Fossard Solar Time Clock do? In watchmaking, we have people like François-Paul Journe and Philippe Dufour making incredible timepieces; quite frankly, however, to truly understand and appreciate their achievements we need to use a loupe to examine the movement. And even then most of it remains hidden within the depths of the watch. With the de Fossard Solar Time Clock we can admire all 750 components with the naked eye, and they ooze quality. With the exception of the jewel holes and the solar time cam, everything is made from scratch by the de Fossards. Time is portioned here in an eight-day movement with a Brocot-type escapement for which the duo even cut the sapphire pallet stones in house. Not only is the execution flawless, so is the movement’s finish. Given the open construction of the clock, there is enough room to admire every detail – and no place to hide even the tiniest flaw. The fact that this exceptional quality comes from a modest workshop in England only adds to the charm and overall experience of this clock. Of course, 750 components provide a clock that does more than tell time (as the name of it already divulges). A hand on a 24-hour scale adjusted for the equation of time tells the time, while a dedicated solar time dial displays the length of day and night, the time of sunrise and sunset, and the time of local solar noon. As if this weren’t enough, the clock can this also be calibrated to show nearly any longitude and latitude on the planet. And you can also calibrate your clock yourself rather than having to rely on a clockmaker: the Solar Time Clock is fitted with two dials, one showing the longitude and the other showing the latitude. This not only makes the de Fossard exceptional but also unique as it is the very first mechanical clock to feature this complication. The de Fossards didn’t stop there, though: the clock also features a hand-painted spherical mean moon phase indication controlled by an unusual “compound worm” mechanism. This device was originally invented by Thomas Mudge in the eighteenth century, but it is not often used by clockmakers due to its complexity. Yet any clockmaker mastering this will be rewarded with an exceptionally accurate moon phase indication, which will only be off by seconds each month. It is no wonder that this mechanism appealed to the de Fossards! The moon is not the only heavenly body present in this clock as it also features a brass earth painted in great detail revolving around the meridian set by the user on the longitude dial. Local time is on a separate dial that is also home to the Greenwich Mean Time and a power reserve indication. As the clock is fitted with an eight-day movement, winding it is a weekly endeavor. The clock comes with a special winding key with one magnetic side allowing the owner to remove the magnetic dust caps fitted over the dial’s winding and setting squares in order to protect the movement from dust. The case of the clock is almost as intricate as its mechanics, mainly due to its elegant, yet complex, shape. It is crafted in hand-finished French ebonized pear wood veneer, which displays a deep luster thanks to a perfect polish. To facilitate the viewing pleasure of the clock’s inner workings, elegantly curved glass windows are integrated into each side of the case. The result is an object that will not only catch your eye but also hold it, as the perfectly finished movement and exceptional complications housed within the de Fossard Solar Time Clock become clear.